That may not be too surprising to you, but this might be... the average number of days away from work for employees filing these claims is 57! Here's another fact that may cause you to strain: the average per injury cost for this type of claim ranged from $8000 - $42,400. Ouch! These are findings listed in a recent report from Travelers Insurance, the largest worker's compensation carrier in the US, which analyzed 1.5 million worker's comp claims between 2010 and 2014. "...“Even seemingly minor injuries, such as strains or sprains, can substantially impact an employee and slow a business’s operations and productivity,” said Woody Dwyer, second vice president, Workers’ Compensation, Risk Control, Travelers..." - Excerpt from IndustryWeek article referencing this report. A strain or a sprain sounds like a minor injury, but 57 days of lost productivity sounds like a major setback! Take care of your employees, and take care of your business with equipment that helps prevent these workplace mishaps. Ergonomic-focused equipment can relieve the strain that causes injury and make the employee more productive with an easier workflow. See these three examples below from Global Systems Group. Each is a machine with an adjustable integrated belt table to make each associated process in mattress production easier and safer. All of these can be coordinated with an Eton System overhead material handling system to make your factory even more safe and productive. More material handling ideas from GSG can be found here. Don't let material handling issues be a strain on your business. 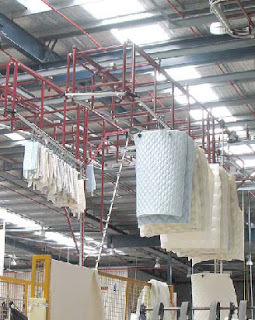 Take a good look at how your workflow is handled and contact GSG to help you create a safer AND more productive mattress factory. Is failure to adopt efficiency-boosting equipment leading to national economic crisis? I've taken the liberty to highlight the key items of this productivity story for you. Quoted economists suggest that increasing labor costs with declining productivity can be a drag on the economy. You can read the rest of the story at Bloomberg, but please use this frame of reference: "does this sound like my manufacturing company?" As this story suggests, "efficiency-boosting equipment" could help you fight weakening productivity and increasing wage pressure. That's the goal of all our new products at Global Systems Group: lower labor costs, more production. 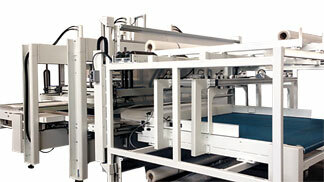 The Mattress Master Optima is one example of "efficiency-boosting equipment" from GSG. We're doing our part to stimulate the economy with equipment offerings like this. Check out this Optima web page to see if this tape edge machine might stimulate the economic conditions of your own business. Connecting manufacturing devices and aggregating the data created is enabling manufacturers to reduce overhead, conserve resources, increase profits and optimize operational efficiencies. Does this sound appealing to you? Of course it does! Does implementing this technology sound intimidating to you? It doesn't need to be! GSG can help. Our new GreenLight XT system can be integrated with your existing machines to get you started on improving your manufacturing efficiencies like those companies in the aforementioned survey. Caption: GreenLight XT manufacturing reporting system installed on Naehtec NC 1001 binding machine. GSG can help you track performance and maintenance of nearly any machine in your factories and view informative data in easily undertsood charts and reports. The first step in gaining impressive efficiency improvements like those listed in the survey results is to get connected with the source of the data: the machine itself. Get connected with GSG to take this first step in your factory!